There’s a reason why everyone’s paying attention to the respiratory virus that’s moving across the USA and into Canada this month. Enterovirus D68 is different. It starts as a common cold. And for some previously healthy infants, toddlers and children, it progresses to severe respiratory distress treated in the intensive care unit. This virus has been around since the early 1960s, and has almost never been as widespread as it is this fall. There is no direct treatment or vaccine, and all treatment measures are supportive. Which is good news, because it means you can start to treat your little ones at home as soon as cold symptoms start. 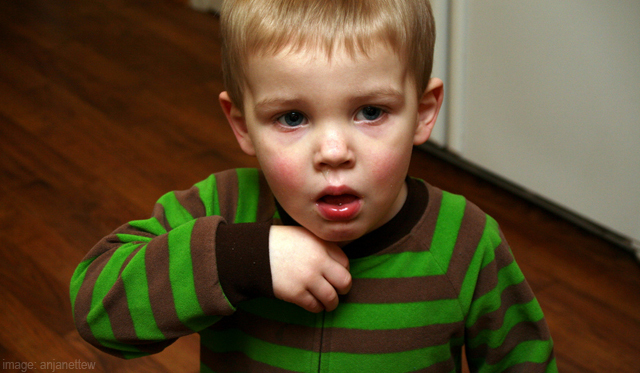 Not every cold this fall will be caused by Enterovirus D68. In fact, most probably won’t be. But to help you prepare, here are some guidelines for what to watch for, how to treat, and when you need to have your child seen in a doctor’s office or ER. And here is a fact sheet on Enterovirus D68 from the Centers for Disease Control. If your child is starting to get congested, increase your attention to hygiene — washing hands, wiping noses, cleaning toys and play surfaces, trying to reduce wet contact between children. If your child definitely has a cold, but is still able to eat and drink, and energy level is only down a bit, you can usually continue to provide support at home. Emphasize fluids, and hygiene. More rest will be helpful, and staying home from school is important. If your child’s cold symptoms are now interfering with sleep, or drinking, or he develops a fever, contact your family doctor, our Day Treatment Clinic, or an after-hours walk-in clinic, as there may be something we can treat, or some additional relief via medications. If your child’s energy level is dropping significantly however, then low energy added to the cold will make it even harder to stay hydrated, and assessment at your local Emergency Room or doctors office/clinic is needed. Increased work of breathing, seen when the skin draws in between or below the ribs, or at the neck, during breathing, is an important sign of the need for more assistance and relief, which means a trip to your local Emergency Room. Thanks for you comment, Catherine! No additional advice at this time aside from the steps described in the post – just keep up with her fluids and be mindful of her energy levels! Excellent advice and simple; a first out there right now! Only you, Dr. Dempsey. If children do need medical assistance, how do they get in to see you at your urgent care clinic? Hi Kana! We currently have time set aside on Mondays for our Day Treatment Clinic. On other days of the week we ask that families just call ahead and we’ll try to schedule them in when possible! Is it possible for adults to spread enterovirus D68 to a child? Anything in particular to look out for in newborns when it comes to this virus? Hello Alyssa! The virus presents the same in newborns as it does in older kids. If a cold starts to disrupt baby’s feeding or breathing you should pay your family doctor a visit. My Lil man is currently 20mths actual (17 mths corrected age). He currently had a very stuffy nose which causes him issues at nap time and bed time. He seems to choke on his breathing. He does not seem to be actually struggling to breathe, and he is not in drawing. He had a double ear infection at the moment as well that they are treating with azithromizine (currently on day 2 of 5 day course) should I worry or seek further treatment or am I dealing. Correctly at home with fluids on demand and infant Advil when needed? His current weight is 28.2lbs. It sounds like you’re dealing with things correctly, Kandice. However, if your son develops a fever you’ll want to see your family doctor again. How fast does it all occur? Within 48 hours I’ve gone from a simple runny nose, to a very bad sinus blockage it feels like with a faucet pouring nose, with frequent fevers and a nonstop migraine, swollen lymph nodes and pain all in my next, with tongue pain, sore throat, cough, phlegm and wheezing with my cough now. Today frequent episodes of diahhrea. I do have asthma . However I am 22 years old. I don’t want to visit the local emergency unless it’s highly recommended as I typically have a low immune system to begin with, so I don’t wanna contract anything further. Can you please give me some advice ? Anything over the counter that can help with this? I’m pushing lots and lots of water to drink. The good news is that enterovirus D68 is only considered high-risk for kids and teens. If you still have concerns about your health though we do suggest making an appointment with a family doctor or visiting a local clinic. Hey, I’m 22 but recently have had a very dry scratchy throat and have been uncomfortably dizzy with a bad, constant headache. My energy is normally set to hyper and I’m an active coffee drinker, but these last few days I’ve been sleeping for 16+ hours, (regardless of coffee or no) and even when I’m awake, I’m too exhausted to manage dishes 🙁 I’m not THAT sniffy or coughy, but the lack of energy is concerning me. In a 22 yr old…. d68? Hi Morgan! The good news for you at 22 is that enterovirus D68 is only considered high-risk for kids and teens. If you’re still worried though, please make an appointment to see your family doctor or visit a local walk-in clinic. I have two children that have both been sick now over the course of this past week. My son has s athma and defects with his heart and both children have beem feverd as well. are there any different signs to be aware of in the event i need to seek further medical help? and how fast does this virus affect little ones that already have a compermised immune system? Hello Wendy! Kids with asthma are certainly at higher risk. In particular, be on the look out for any breathing complications that arise and disrupt your child’s sleeping or eating.